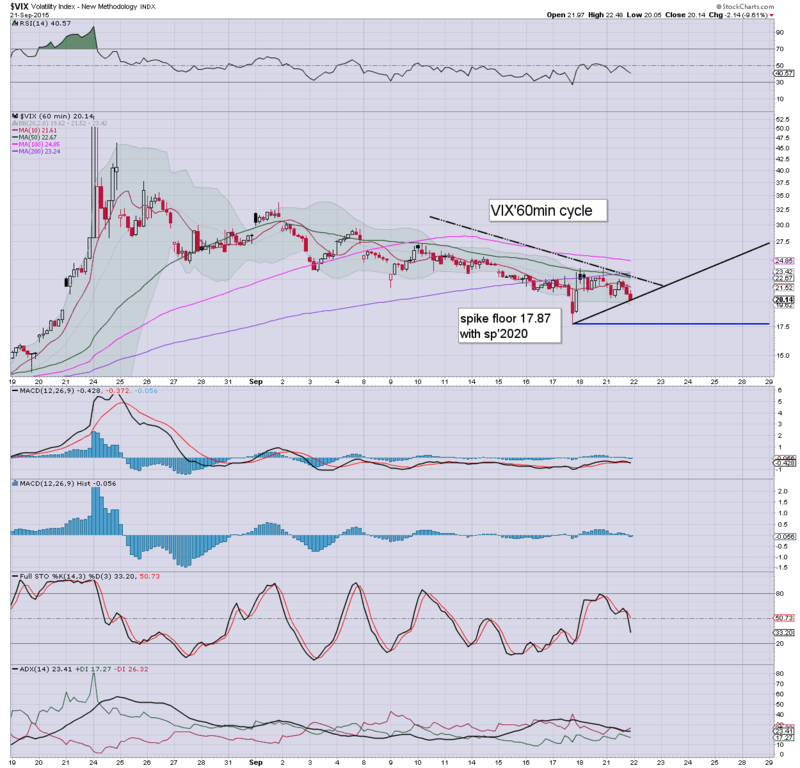 With equities trading significantly lower, the VIX was back on the rise, settling +11.4% @ 22.44. Near term outlook offers increasing equity weakness, which should equate to VIX at least in the 28/30 zone within 3-4 trading days. 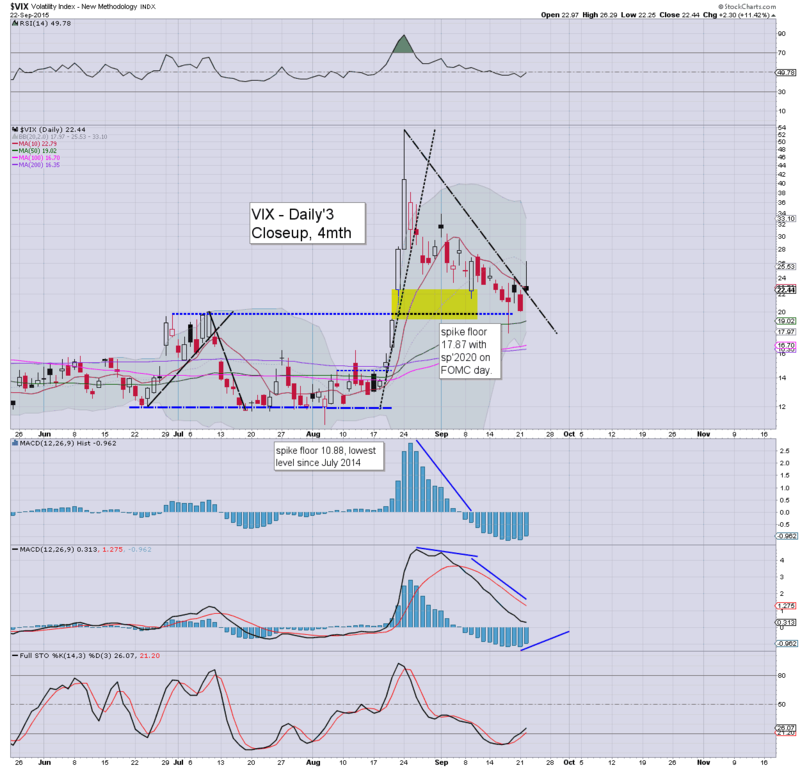 VIX 40s look viable on a break <sp'1867. 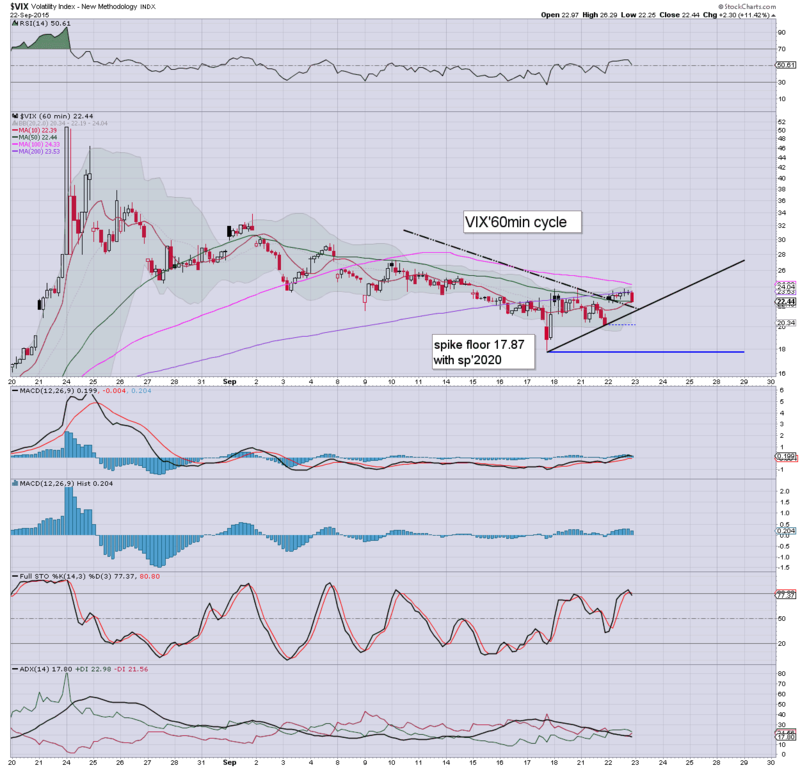 *Intra high was 26.29 on the daily charts, but actual 'trading' high - seen on intraday charts was 23.79. Call it a 'rogue print'. Underlying MACD (blue bar histogram) is set to turn positive this Thursday.. or more likely Friday. 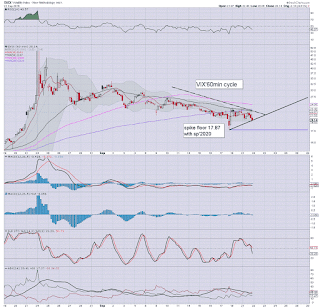 Certainly, there is huge upside potential into end month, and frankly.. VIX 30s look extremely likely. *I am LONG-VIX from the 23s.. seeking an exit in the 28/30 zone.. before the weekend. 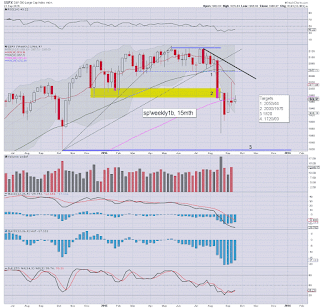 US equity indexes closed significantly lower, sp -24pts @ 1942 (intra low 1929). The two leaders - Trans/R2K, settled lower by -2.5% and -1.5% respectively. 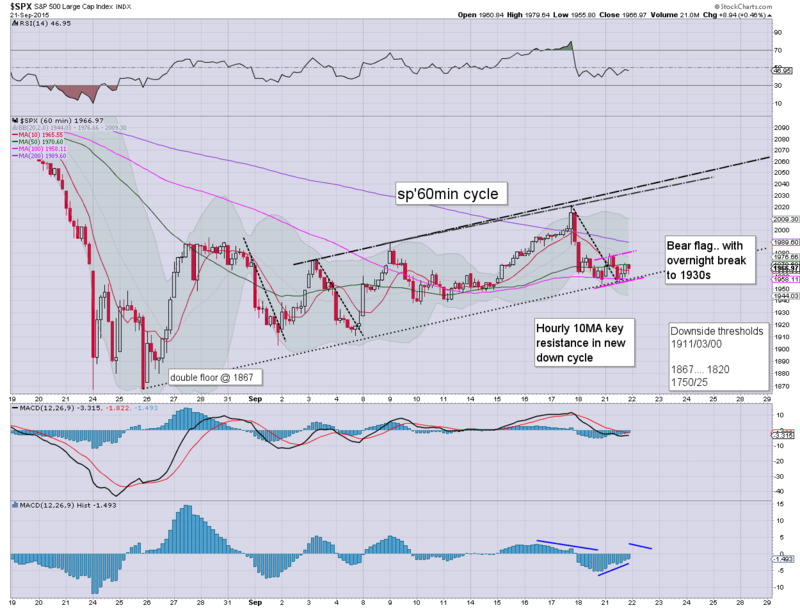 Near term outlook offers a test of the sp'1900 threshold.. which will likely not hold. 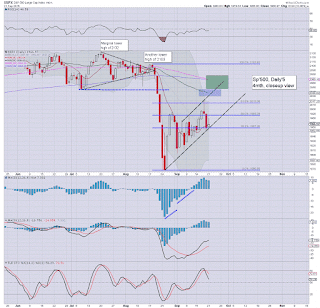 *closing hour... moderate bounce... but in the scheme of things... nothing for the equity bulls to get excited about. So... a sig' net daily decline, a day for the bears, not least those who bravely (or recklessly?) were short overnight. 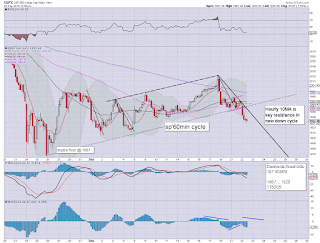 Broadly.. the bigger weekly/monthly cycles are absolutely crystal clear.. we're headed lower into Oct'. 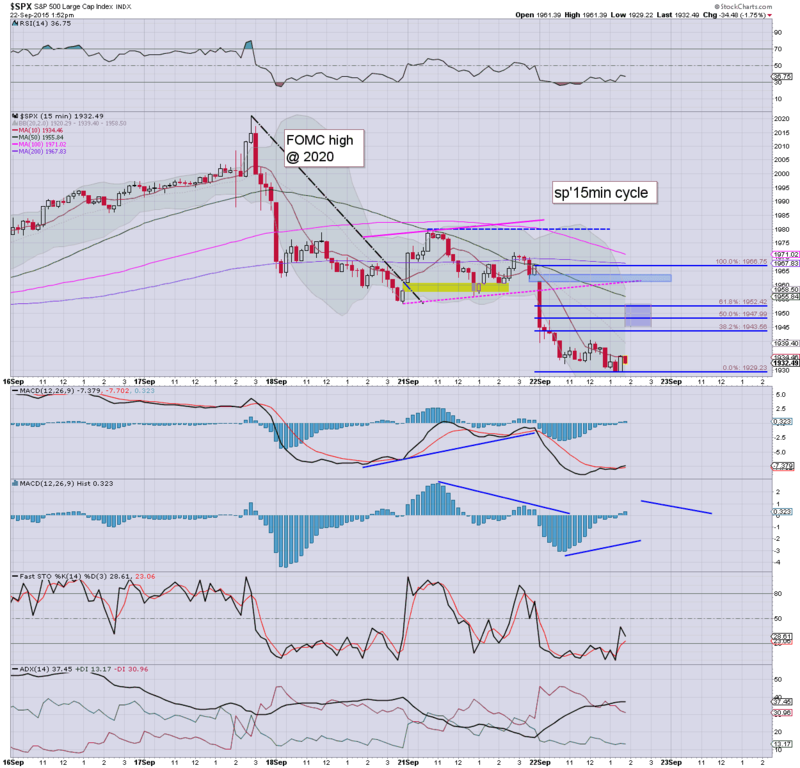 *yours truly is short overnight... AAPL, INTC, SPY, and long-VIX. 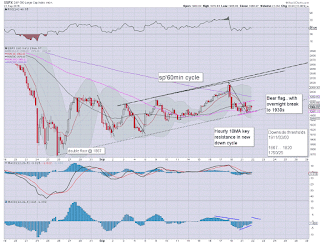 Seeking a provisional exit in the 1900/1870 zone.. which seems entirely viable before the weekend. Regardless of the exact close, US equity indexes are set for significant net daily declines, with a likely close in the sp'1945/30 zone.. with VIX 22/23s. There is high threat of a Wed' gap lower to the 1900 threshold... and on any break... next stop would be a test of the 1867 floor. 3.03pm.. LONG-VIX.. from the 23.40s. *so.. four short-market positions... and I am done for today. 3.31pm.. well, there is sp'1940... market playing the same game like yesterday? Climb into the close.. and then gap lower at the Wed' open? Regardless, I've done what I can.. now I wait for sp'1900... and lower. US equities have broken a new intra low of sp'1929... but still look vulnerable to clawing back into the 1940s.. before renewed weakness into the close. 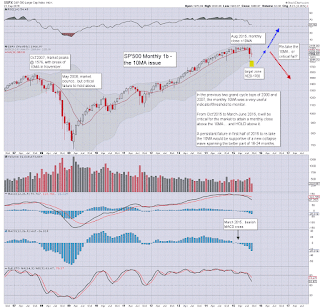 Broadly.. the 1860/20 zone looks a given by end month.. which should equate to VIX 40/45. The smaller 15min cycle remains offering the 1940/45 zone in the 2pm hour. Frankly, that is probably the best short-level I expect right now... and I'll likely get heavily involved this hour. Updates across the rest of the day.. not least if I start hitting buttons. 2.25pm.. notable rebound in Oil... almost net higher. Someone buying from 1.30pm onward. 2.34pm.. sp'1937.... best guess 1941/43... then stuck. US equities have marginally broken below the morning low. The smaller 15/60min cycles are offering a little more upside in the 1pm hour.. but broadly... the underlying downward pressure is again increasing each day - as was the case in mid August. *I am on standby to initiate a number of short positions within the next few hours. 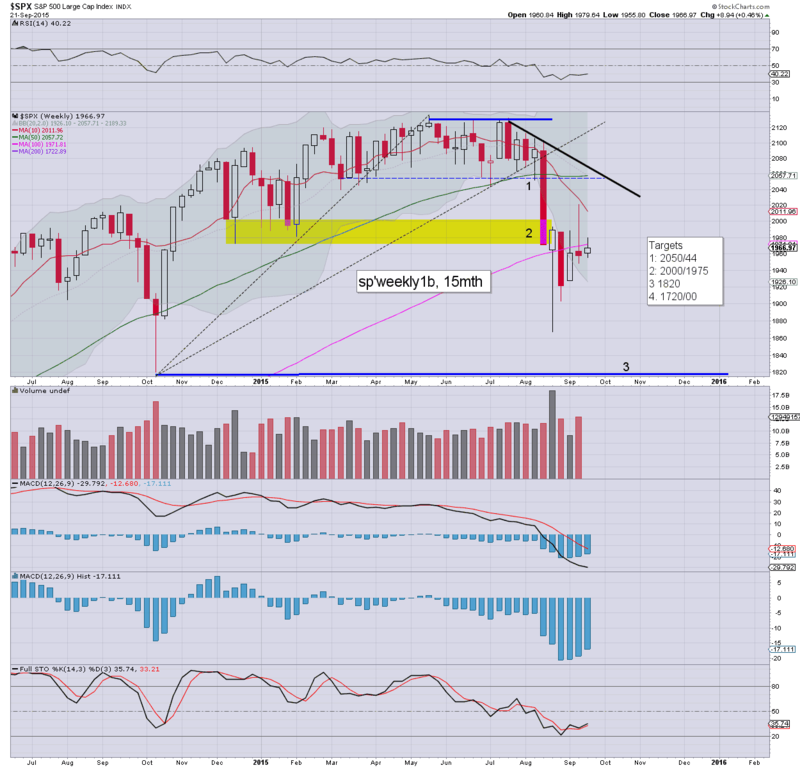 However, if market sees renewed weakness.. before 1945/50... I will probably stay out. Whilst US equities attempt a natural rally/bounce into the afternoon, a rather appropriate new movie trailer has appeared... 'the big short'. No doubt it will remind some that corporate corruption is indeed rife... and there is indeed a valid time to short the American.. and greater world economy. So.. market is battling it out.. having broken and decisively confirmed that the big bear flag from sp'1867/2020.. is complete. 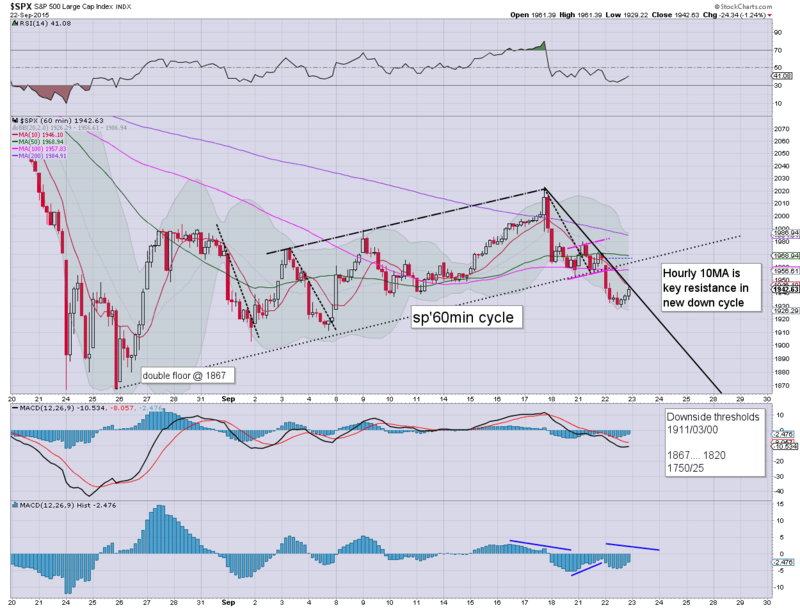 Many are (somewhat) understandably calling for renewed upside from current levels.. but I would merely argue they are in denial about the importance of the initial breakdown in August. *I remain on standby to initiate a number of short positions this afternoon, if price action looks okay. 12.10pm.. sp'1939... minor up wave.. underway.... with a short term floor of 1932. Best guess.. 1945/50... before rolling over into the close. I have multiple targets locked and ready to launch.. based on the bigger weekly/monthly cycles.. both offering sub 1900' within the immediate term. 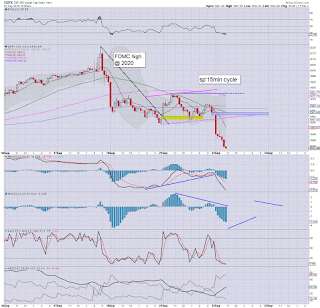 US equities continue to slip, with the sp' in the 1930s.. along with VIX 23s. 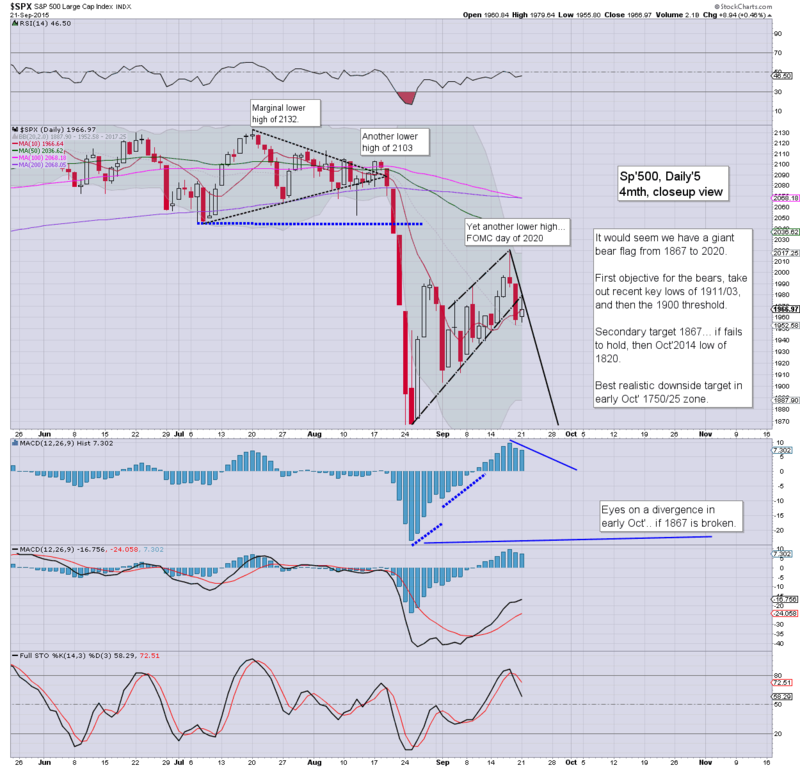 There is high threat of 3 hours of bounce/recovery into the afternoon. Broadly though, the opening break is key, and the outlook into early Oct' should now be clear.. at least to those not wearing a cheerleader uniform. 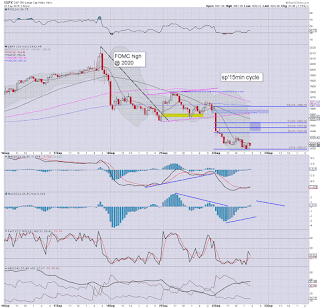 The hourly 10MA will be strong resistance.. and will likely be around 1950 by 2pm. *I am on the sidelines... 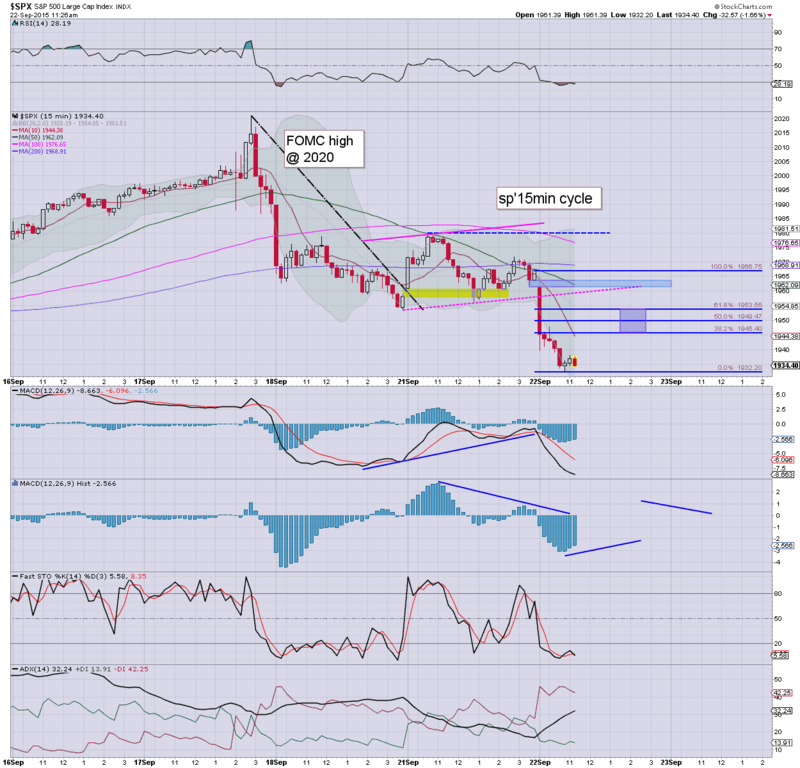 I've multiple targets to short... on the next intraday bounce. 10.58am.. provisional sign of a floor from sp'1932. Upside target would remain 1945/50 zone by 2pm. 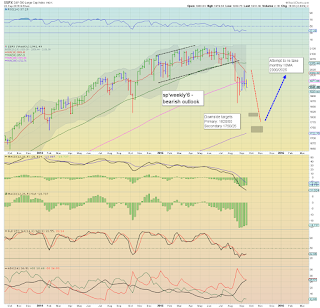 A daily close <1950 looks probable. US equities open sharply lower, with what is a clear break below last Friday's low... causing all manner of technical damage. 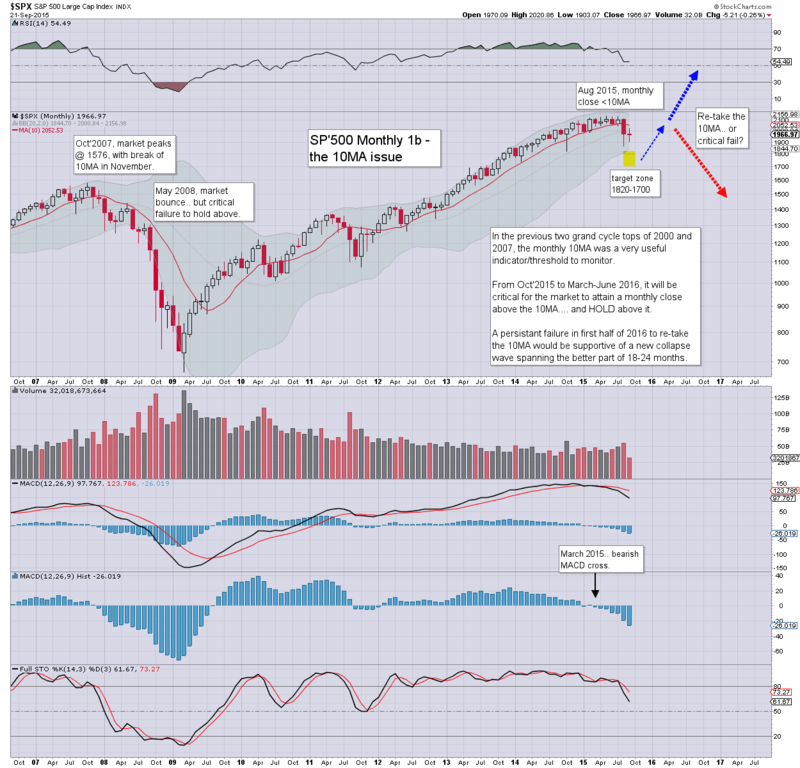 The wave from sp'1867 apparently concluded last Thursday @ 2020. The bigger weekly cycles continue to warn of much lower levels into Oct'. 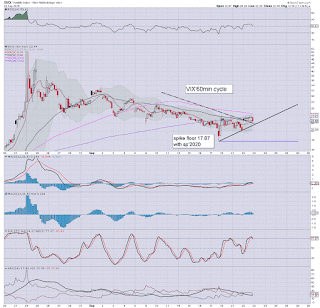 *I'll be looking for the weekly 'rainbow' candle to turn red by the Friday close... if so.. that'll offer either 1820... or the low 1750/25 zone by Oct'2nd. 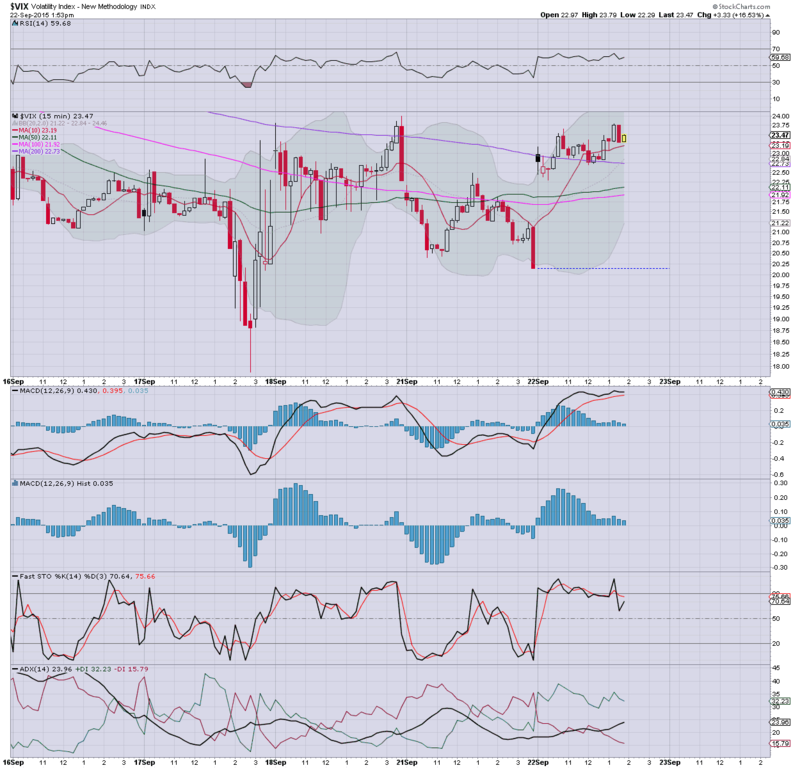 I was keeping a very open mind yesterday, but I did note the Transports last night.. in that it was argubly back-testing the broken rising trend. 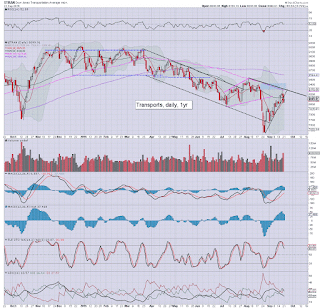 It would seem Trans' was warning that we maxed out... and we're now headed lower. 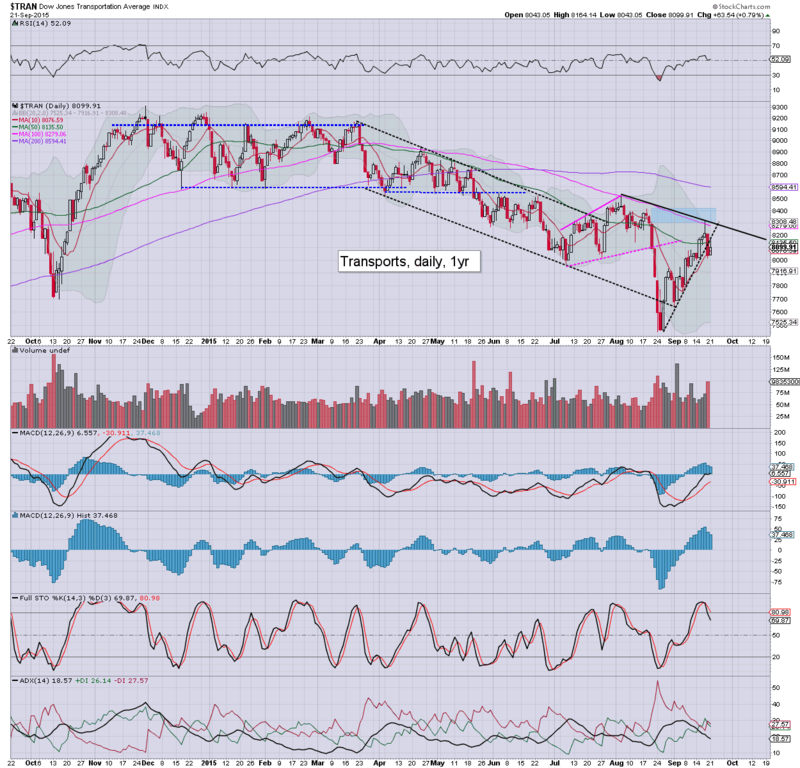 In the case of Trans, primary target is 7000... which is indeed a long ways lower. *I am seeking to pick up at least one short position this afternoon. For now... I want to see a floor... and then a bounce into the 1-2pm time frame. time for an early lunch... back soon. Good morning. Equity futures are sharply lower, sp -25pts, we're set to open at 1941, which will likely equate to the VIX in the 23/25 zone. With the USD +0.1% in the DXY 96.00s, metals are weak, Gold -$2, with Oil -1.8% in the $45s. 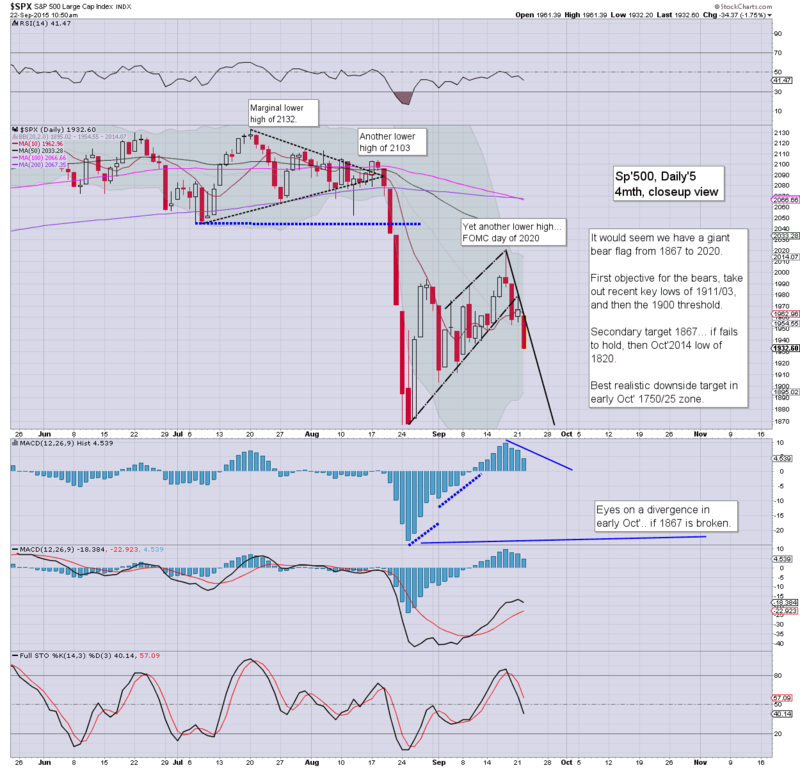 *I've adjusted the hourly charts to reflect a higher lower in the VIX, and what is now a bear flag in equities. -We saw a key high on FOMC day of sp'2020, with a VIX low in the 17s. -Market closed net higher on Monday... but price structure was actually a bear flag. With the overnight break into the sp'1930s.. I am ditching any hope of renewed upside to the sp'2000s. So... now its about finding an intraday entry... which will not be easy. If we get a morning washout by 11am.. say sp -40pts @ 1926... a bounce into the afternoon might see us bounce to 1940... but that would likely be it. Overnight China action: A positive Tuesday session, with the Shanghai comp' +0.9% @ 3185. 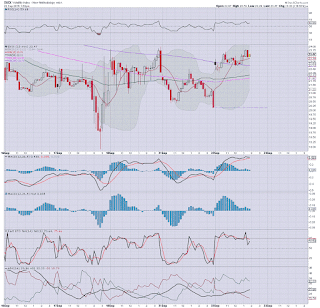 Daily upper bollinger is around 3275/3300... a move above there looks difficult. With US/EU markets now looking in trouble, China will be set to break lower in the Wed' session... and Japan opens on Thursday of course. 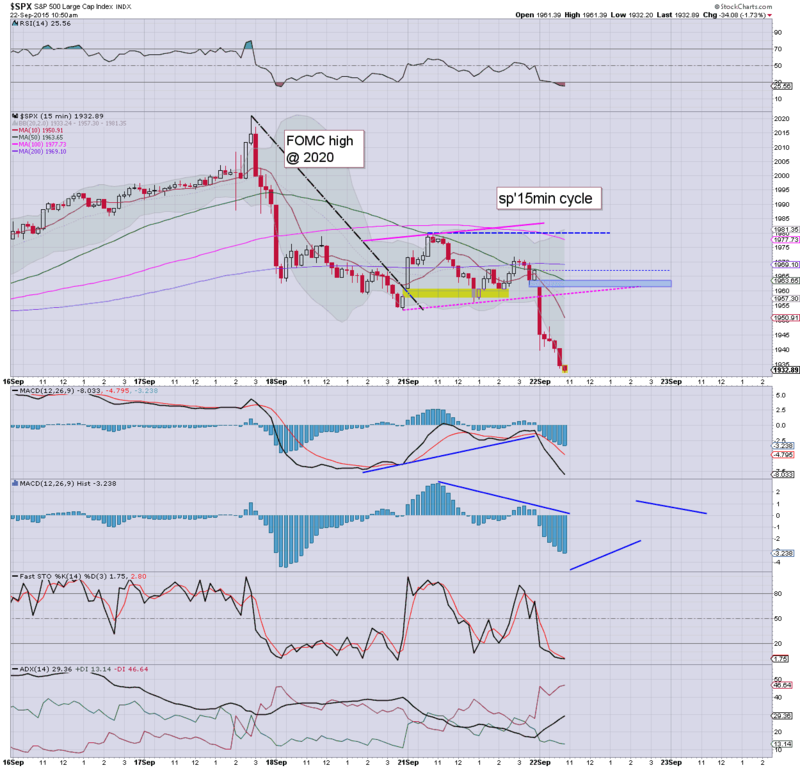 I'm throwing out any hope of renewed upside to the sp'2000s, and will try to find an acceptable short entry sometime in the early afternoon. It is an annoying situation, but it is.. what it is. Anyone think we can claw back above yesterday's high of 1979? 8.50am.. sp -28pts.... 1938.... absolutely decisive break on any measure. A morning floor in the 1935/25 zone looks highly probable.. before a 10/20pt bounce by the 2pm hour. From there... the trade is arguably obvious. 9.40am.. VIX +12% in the 22s... kinda interesting... but this remains a lowly VIX. Lets see where we floor this morning.... and how high can rally into the afternoon. For now.. I sure ain't chasing. It remains highly amusing how many are glossing over what was severe technical damage to the weekly/monthly cycles in August. There remains very high threat of renewed severe downside into October. 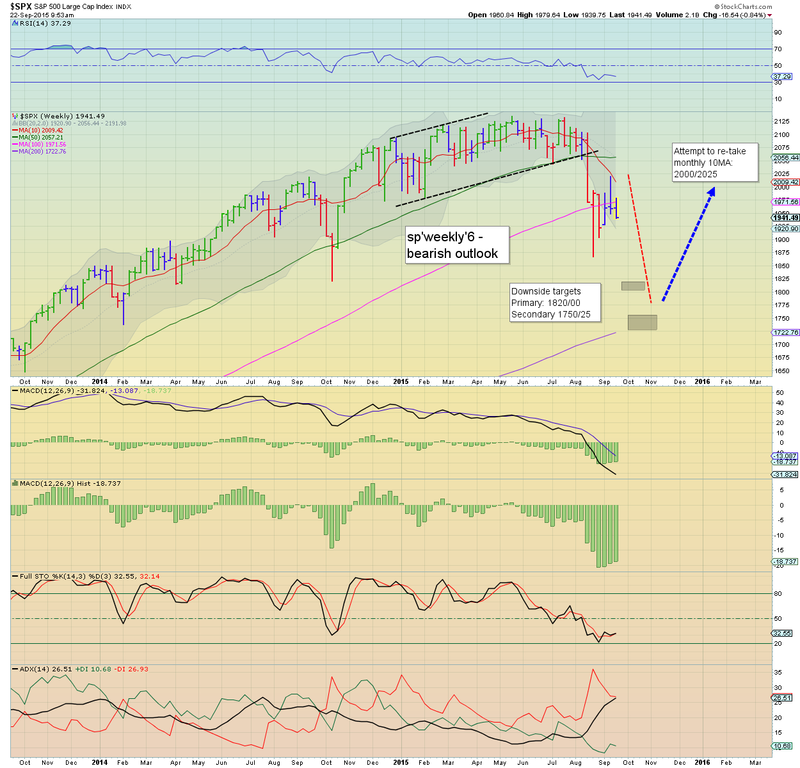 Until the market is back above the monthly 10MA (sp'2052).. the bull maniacs should remain highly cautious. A little higher into Wed/Thursday.. and then (in theory).. we should fall... and keep falling into mid October. *Fed official Lockhart is set to speak... but that is after the close. US equity indexes closed moderately mixed, sp +8pts @ 1966. The two leaders - Trans/R2K, settled +0.8% and -0.2% respectively. Near term outlook is for continued upside to the sp'2030s.. which should equate to VIX 16/15s. From there... things should get real interesting. *I've not adjusted the Trans daily trend line - as was broken on Friday. The break was pretty severe.. and we even back tested it today. 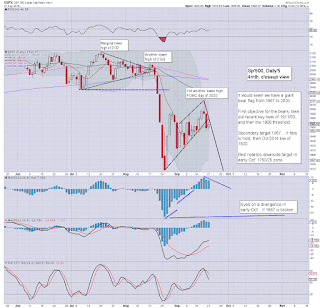 Rest of the indexes are suggestive of further upside. For now... I'm leaving the Trans chart unchanged. 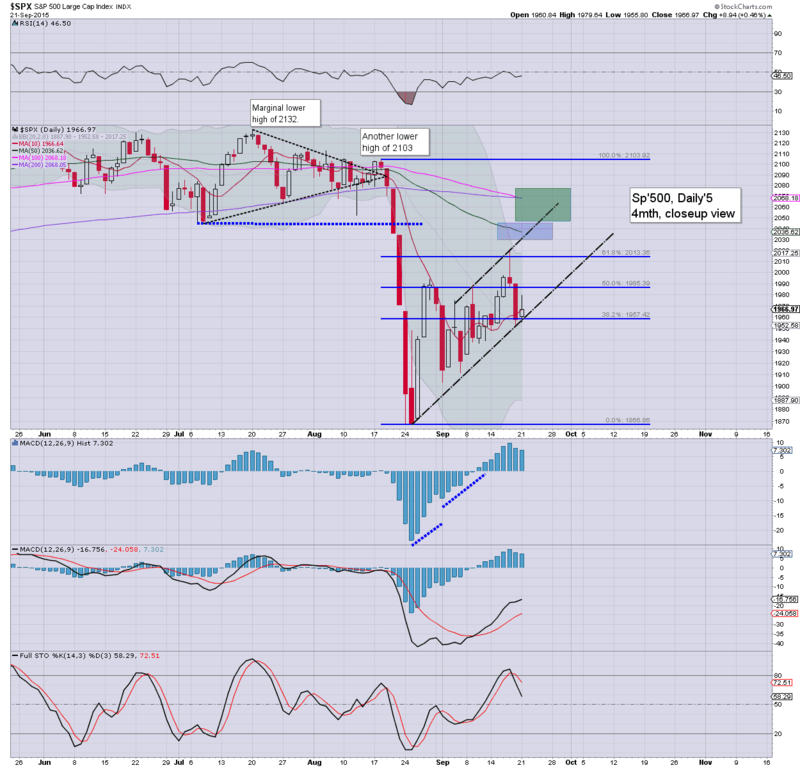 Best guess.. sp'2030s.. where the 50dma is lurking... before next rollover.